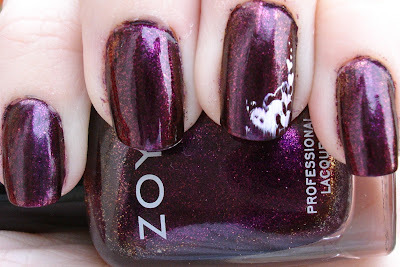 Here is another stunner from the Zoya Flame collection! This is two coats of Zoya Valerie, which is described by Zoya as: "Royal purple, dark violet, red, deep pink and gold iridescence amplified by a glittering sparkle finish." This is a really gorgeous plummy purple with lots of sparkle. Application was pretty amazing, as I have found with all of the polishes in this collection, with a really decent dry time. It would have almost got away with one coat as well, so it is a very opaque polish. I added the hear design from plate m59 using Konad Special White polish. I also tried out a new topcoat for this manicure - Essie Good To Go, which I got free while back with purchase of Essie polish. 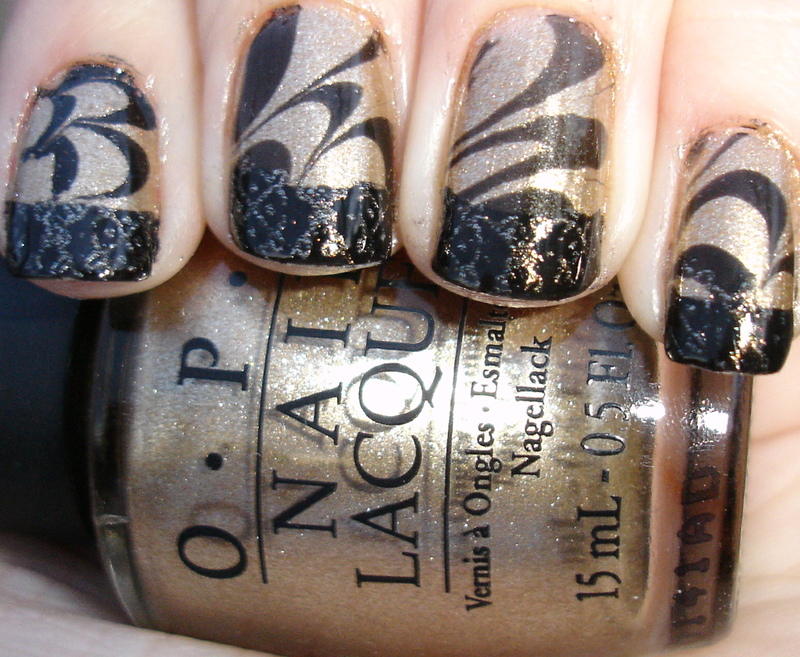 For the most part, I really liked this topcoat - dried really fast, packed a lot of shine, and no tip shrinkage, yay! This is my main reason for wanting to find a new topoat - I love my Seche Vite, as it dries so fast and is very shiny... but the tip shrinkage! I think every mani I use it on gets noticeable shrinking at the tips, and it is kind of sad. Essie seemed to do the job - HOWEVER, it smeared my Konad a lot. This leaves Seche as the only topcoat that I can use and either not smear my Konad at all, or only so minorly that it is only visible in photos. So I will save the Essie for color only, no Konad.. and keep looking. Any suggestions? Finally, a question for all of you: I am doing a small holiday giveaway coming up next week, and I have two smallish prizes for it. My question to you, is whether you would prefer to have two separate winners that each receive one of the items, or one winner that receives both? Let me know, and whatever you all seem to like most, I will do! Also, if you have not yet, do not forget to VOTE IN THE GOLD MANICURE DUEL! I like SH Insta Dri top coat (red bottle, not the drops). More winners is better as far as I'm concerned. I think two small prizes is better. I can't help wondeing if maybe you didn't wait long enough before applying your top coat? It's always such a bad surprise to have a smearing Konad, it can spoil all your decoration... But this Valerie colour is really perfect!! As for your question, I'd say that 2 separate winners are better, because it gives us more chances but this is only if you're wiling to pay for two shippings. Anyway, thank you, always, for your ideas and generosity! Oh and I just posted a picture of my Heidi cat - she looks so much like your kitty (except Heidi has a perpetual grump face - and your kitty has an angelic face!). i want invite you to see my blog. Now have a giveaway with brazilian holographic polish nail and another prizes. This giveaway is open internationally. Brooke - Of course I would vote for you, your blog is still definitely one of my favorites! ;) And Heidi does look a lot like Luna, you're right.